It is the start of the 3rd industrial revolution. 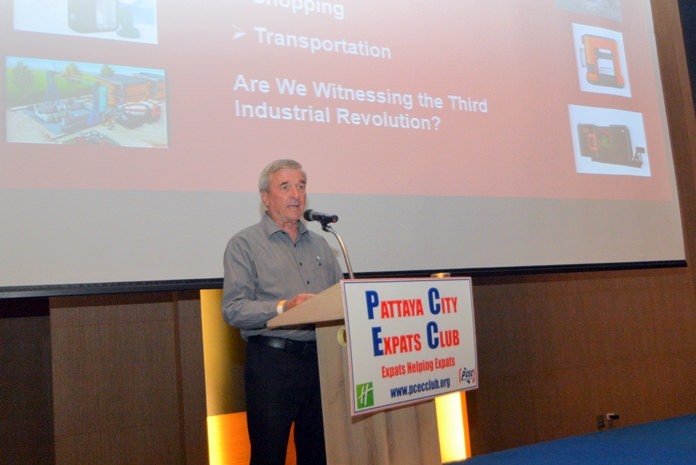 Club Member Ron Hunter spoke to members and guests attending the May 14 meeting of the Pattaya City Expats Club (PCEC) about 3D printing. He mentioned that the world of 3D printing, also known as Additive Manufacturing (AM), is poised to change the world of production, design and logistics, within just a few years. The way we look at how houses are constructed, tangible goods are manufactured, stored and distributed is about to become much different. As the famous baseball coach Yogi Berra once said: “It’s tough to make predictions…especially about the future.” But the talk today attempted to see where we are headed. Ron Hunter explains to his PCEC audience why he believes 3D printing will be the technology that starts the 3rd Industrial Revolution. He described the current state of the technology and where it is going. He notes from houses to kidneys, 3D printing will change your life. He mentioned that in his view, 3D printing is the beginning of the 3rd Industrial Revolution. He spoke about his experience with 3D printing during his aerospace engineering career and where he believes the technology is headed. Whether it is housing, manufacturing, medicine, shopping or transportation, life as we know it will soon change for the better. Just hang in there for another 10 or 15 years! Ron Hunter is a 20 year, retired, U.S. Marine. He was an aircraft maintainer, systems instructor and systems manager during his military career. He is a graduate of Southern Illinois University, became a private pilot and an experimental aircraft builder, then entered the aerospace engineering field in 1986. He worked with McDonnel Douglas, Long Beach, CA on the T-45 Goshawk, a USN Primary Jet Trainer, as a systems instructor, then moved to Northrop Grumman, El Segundo, CA, in 1989. He spent 20+ years on the F/A-18 Hornet/Super Hornet/Growler aircraft programs as a Reliability, Maintainability and System Safety (RM&S) Engineer, until his retirement in 2009. He now lives in Pattaya, married a lovely Thai lady, Ae, and is enjoying life to the fullest! Ron pointed out that the 1st Industrial Revolution started in the 1600’s when industry went from hand production, to machine production, using steam and water machines, led primarily by the textile industry. The 2nd Industrial Revolution, also known as the Technological Revolution, began in the late 1800’s with advancements in electricity, electric motors, petroleum, automotive and telecommunications, which created a major turning point in history. The contention is that we are now witnessing the early beginnings of the 3rd Industrial Revolution. A definition of 3D printing is simply the process of printing three dimensional objects from a digital file. Whereas, Additive Manufacturing is the technology that builds 3D objects by adding layer-upon-layer of material whether the material is plastic, metal, glass, ceramics, concrete or human tissue. The field of 3D Printing/Additive Manufacturing has been around for over 20 years, but the applications and technology improvements have grown exponentially. What started as a way to produce inexpensive automotive and aircraft mockups, has evolved to not only providing production parts, but now includes printing almost any tangible product. These products can be produced locally, without the need to warehouse or to transport goods globally. MC Roy Albiston welcomes members and guests to the PCEC Sunday meeting before introducing fellow member and retired engineer, Ron Hunter, to give his presentation on 3D printing technology. Ron explained and provided examples of the seven categories of 3D Printing/Additive Manufacturing, developed by the International Organization for Standardization, commonly known as ISO. These categories are: 1. Steriolethography – Where a laser prints onto a liquid polymer film. 2. Material Jetting – Ink-Jet Printer, “prints” material, layer by layer. 3. Binder Jetting – Jets a binder (glue) onto a thin layer of metal, ceramic or glass powder. 4. Material Extrusion – Squeezes material, layer-by-layer. 5. Powder Bed Fusion – Laser prints onto a thin layer of powder. 6. Sheet Lamination – Ultrasonically welds metal foil to plastic or other materials. 7. Direct Energy Deposition – Laser melts streaming metal powder onto an existing surface. Houses and other products are now being produced using the 3D/Additive Manufacturing process. A YouTube video demonstrated how scientists have developed a giant, 3D, concrete printer that can build a 2,500 sq. ft. (232 sq. m) home in just 24 hours. The robotic gantry squirts concrete onto a surface, based on a computer 3d model, which includes all necessary electrical, air-conditioning and plumbing requirements. A company in China can build 10 homes in less than 24 hours and they have also built a 15-floor building with this process. Full size furniture, tools, utensils, artwork, jewelry, clothing, electronics and even food will soon be printed with this technology. Perhaps the most promising advancement is within the medical field. A video shows the inside of a MIT lab where a doctor is working to solve the issue of 100’s of thousands of people waiting for an organ transplant. He believes that within 10 to 20 years, body organs will be 3D printed, using the patient’s own tissue, eliminating the rejection issues present today. They have printers that can print cells, artificial blood vessels and a liver. Printed tissue is also used to test drugs. They show how drugs move from the liver to the heart etc. and will eventually eliminate the need to use animal testing. The “Organs on a Chip” device is a game changer for drug testing and development. A short TED video shows a guy named Luke, who received a 3D printed bladder, using his own tissue. Luke, now a college student, talks about being a very sick, 10-year-old child, facing a lifetime of dialysis. After getting the bladder his life got much better. He was able to become the wrestling captain for his High School team and has had the organ for 10 years. Many videos on this subject are available on YouTube and Ron encourages anyone with an interest in the future of this technology to check them out. He concluded with letting the audience answer the question: Are we witnessing the beginning of the 3rd Industrial Revolution? 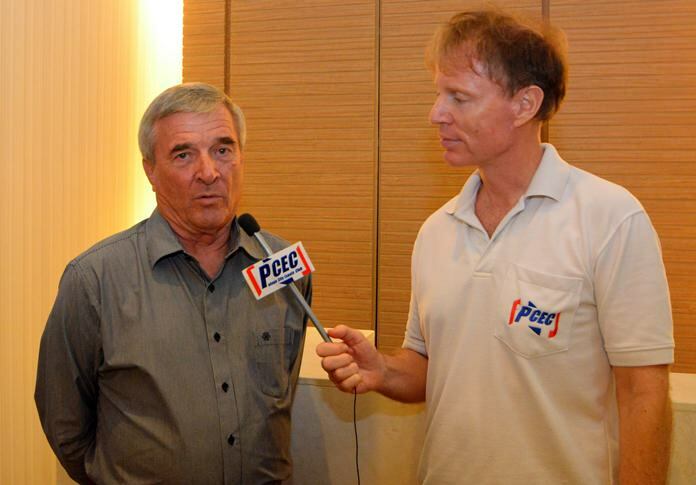 After Ron’s presentation, MC Roy Albiston brought everyone up to date on upcoming events. 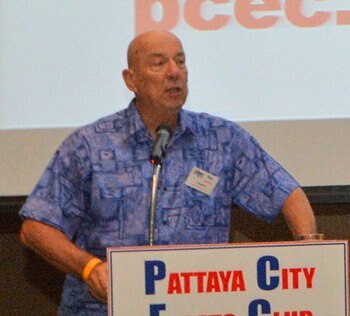 This was followed by the “Open Forum” portion of the meeting, where questions are asked and answered and comments made about expat living in Thailand.